Part of the way through The Dark Knight Rises, there’s the sort of scene you never see in a big budget action movie: a superhero goes to his doctor for a checkup. Sure, it’s a bit that’s mostly played as comic relief – a point underscored by the casting of Reno 911 vet Thomas Lennon as Bruce Wayne’s M.D. – but when the doctor starts to discuss the lack of cartilage in Wayne’s knees and the damage to his kidneys and brain tissue that has been incurred from his years of crime-fighting as Batman, it’s a bracing reminder that Batman can be hurt and potentially even killed. It’s the sort of moment that makes every fight that comes after that scene more brutal, since you know how much each blow hurts Bruce Wayne’s already aching body, and when Batman and Bane go mano a mano at the movie’s midpoint, there are actual physical consequences that Wayne has to spend the rest of the movie healing from. 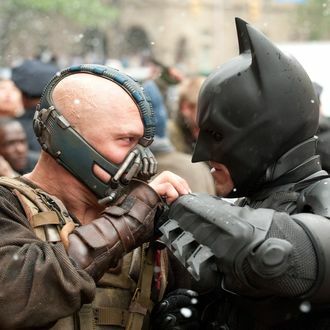 In The Dark Knight Rises, then, the punches actually seem to matter. So why don’t more action movies do this? More than most films, an expensive action movie tends to be the product of a thousand studio notes, and the biggest suggestion that executives like to give to a writer or director is to “up the stakes”: Make the conflict more massive! Give the protagonist a huge goal with big obstacles! Find a ticking-clock device to make things more suspenseful! The irony, though, is once the hero gets into a fight scene, the stakes seem to disappear. Though it’s long been a problem in this genre, modern fight scenes increasingly resemble weightless video game punch-outs where the combatants might as well be made of CG for all the harm that a punch or kick or fall seems to do. Take the recent remake of Total Recall: After Colin Farrell learns that wife Kate Beckinsale is a sleeper agent trying to kill him, he jumps out of their apartment – several stories up, mind you – and plunges through several rooftops and awnings, making even more death-defying jumps and landings until he ends up on ground level, ready to run as thought his feet and ankles haven’t been utterly demolished in the process. Later, Jessica Biel gets punched in the head and ribs repeatedly by Beckinsale but suffers nary a bruise or broken bone (only an attractive, half-inch scrape on her forehead), and at one point, Farrell must cut a hidden device out of his palm; you don’t need me to tell you that a few scenes later, he’s punching with that hand like nothing ever happened to it. When you think of some of the best fight scenes of all time, they’re the ones that felt heightened, yes, but without sacrificing real consequences. Take that great sword fight from Rob Roy, where Liam Neeson and Tim Roth get so exhausted from their effort, and Neeson so wounded, that every moment seems more dangerous than the last. Think of Indiana Jones in Raiders of the Lost Ark, often overmatched to the extent that he’s got bruises for Marion to kiss later on. (Alas, in the most recent Indy film, Steven Spielberg sacrificed Harrison Ford’s most appealing trait as Jones – his vulnerability – so Indiana could go weightlessly river-rafting down some steep-drop waterfalls that would have killed even Dr. Richard Kimble.) Or think of Bruce Willis in Die Hard: The stakes seem so monumentally high in that movie because we’ve watched John McClane pull his bloody feet through broken glass. He can be hurt, so he might be killed. Then again, even The Dark Knight Rises forgets its own lesson by the end; like Iron Man in The Avengers, Batman gets dramatically stabbed in the side – you know, the kind of thing that would probably kill you! – but it amounts to a cheap “oh no” moment, since both superheroes continue unaffected in their quests, even though they’re most likely bleeding into their small intestines. (Shawarma can probably wait until you’ve had medical attention, Iron Man.) But for most of its running time, it manages to reinvent the standard superhero fight scene just by giving it some painful stakes. If only other filmmakers were creative enough to pack the same punch.